On Saturday, July 15th, the Mental Wellness Center hosted its annual Mental Health Arts Festival in De La Guerra Plaza, honoring the creative talents of local artists in our community living with mental illness. More than 75 artists participated this year and showcased their work, including paintings, drawings, sculptures, jewelry and more. Attendees were also treated to poetry readings, karaoke and live musical performances. Each year, our Arts Festival seeks to raise awareness and reduce the stigma of mental illness, while recognizing the talented individuals in our community who are as diverse and beautiful as the art they create. Thanks to everyone who joined us for this event and a special thanks to our artists for participating! Click here to view photos from the Arts Festival. We recently welcomed many new staff members to the Mental Wellness Center team! Above are some of our newest and fabulous recruits. We are proud to have a dedicated staff that is passionate about our mission and we look forward to working with our new members to continue meeting the needs of people in our community affected by mental illness. 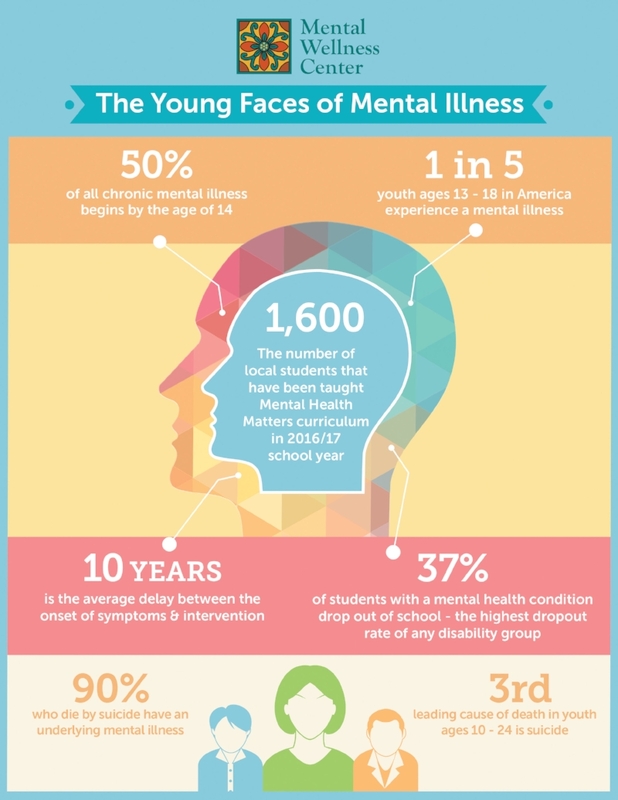 Did you know that 50% of all chronic mental illness begins by the age 14? The average delay between the onset of symptoms and some sort of intervention is 10 years. At the Mental Wellness Center, we offer programs and support groups for teens and their parents to learn more about mental illness, its symptoms and resources that are available, such as our Mental Health Matters course and our Keeping Connected support group. It’s time for lunch at the Fellowship Club! The Recovery Learning Center at the Fellowship Club is a day program that provides services for adults living with serious mental illness, and also serves as a place where our members come together for healthy meals to socialize and build a community for wellness. We’re proud to provide warm meals to approximately 50 people each day and feel gratified seeing the Fellowship Club lunch line continue to grow! For more information on the Fellowship Club, click here. Barbara Schreibke, our tenant liaison at the Garden Street Apartments, works closely with our residents every day to meet their individual needs. When one of those residents, Emily Efin, was going through a particularly challenging time, Barbara supported her and remained dedicated to helping her do what it takes to keep her home. Click here to watch the short video Emily put together to thank Barbara for all of the support and compassion she has shown her. A heartfelt thanks to Barbara and all our wonderful staff for their continued dedicated to our clients!